Bring a large pot of generously salted water to a boil and cook the pasta until it’s al dente. Melt the butter in a large saucepan over medium heat. Add the flour and cook, stirring, for 1 minute. 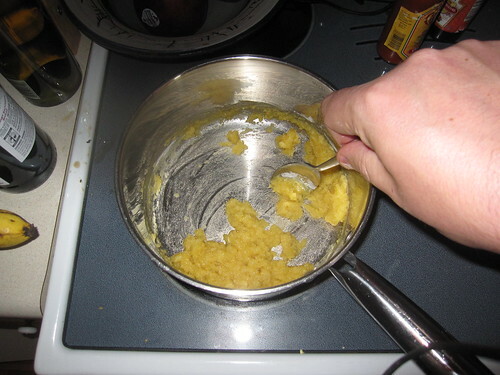 Whisk in the warmed milk and bring to a simmer, whisking constantly (the mixture will thicken as the heat increases). I have a three year old boy and a one year old girl at home and macaroni and cheese is pretty much a guaranteed hit. However, I usually find the stuff out of the box to be pretty blah – I’ll jazz up my own with all kinds of things, but it’s still not the best. Thus, I really like homemade mac-and-cheese recipes – they let me create something quite enjoyable for me and the kids still go wild. This recipe is right in that wheelhouse. To select this dish as a “meal” is an insult to your listeners. 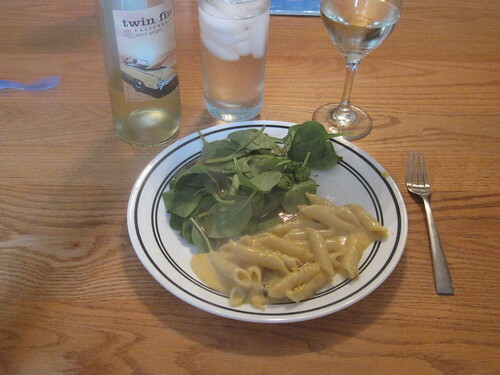 NPR says “a budget-conscious meal for a family of four that’s healthy”. I guess that we should expect a not-so-healthy option from the owners of a BBQ establishment. My perspective is a bit different. I fall in line with Julia Child, who advocated a widely varied and balanced diet that included some fat, and she lived a very long life doing just that. For us, a recipe like this is fine if it’s used as a side dish and is complemented with some healthy options – we chose to eat it in conjunction with a large spinach salad, as you can see in the picture above. However, we did make some substitutes right out of the chute. Instead of using pork bacon, we chose substantially healthier turkey bacon. We used skim milk instead of whole milk. We used low-fat cheeses as well and we used a healthy penne rigate for the pasta because we couldn’t find a healthy cavatappi. Even with those choices, though, this wasn’t the healthiest entree – it should definitely be a side dish. This is arguably the most unhealthy substance on earth, but it gets quite a bit better from there. At the same time as I was preparing the sauce, the pasta was boiling over on the other burner. Once the sauce was consistent (and delicious! 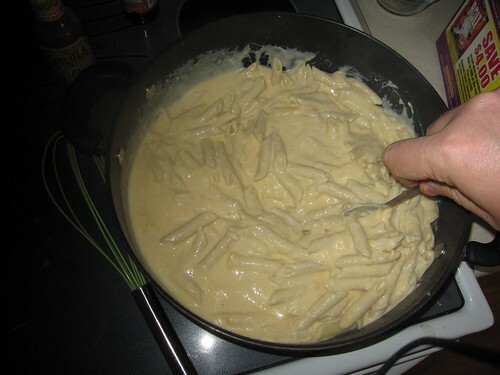 ), I drained the pasta, then added the creamy sauce to the penne, stirring them together. This itself looked good enough to serve as a side dish – and tasty enough, too. I wasn’t done yet, though. I poured the pasta and cheese into a three quart casserole (note: a three quart isn’t quite big enough to contain all of the ingredients – I had just a bit of extra pasta that wouldn’t reasonably fit). 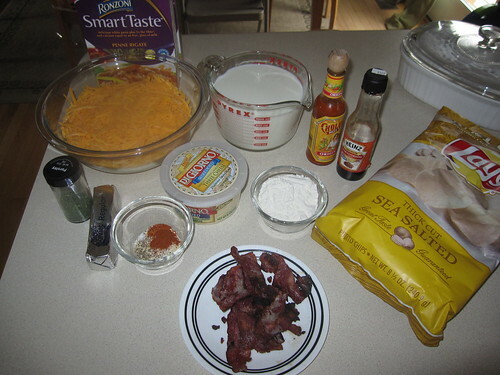 Then I tossed the remaining ingredients together – the chips, the crushed turkey bacon, and the cheese – and put this mixture on top. Here it is before it went in the oven. It was fine, though. The top was a bit crunchier than expected, but still tasty, especially if you broke it up and stirred it into the pasta. We had a ton of leftovers. We wound up eating this as a side three more times, so this will make plenty unless you eat an exorbitant amount. I would halve the recipe. Did we like it? We loved it, all of us. The kids ate it like there was no tomorrow and my wife and I both loved the variety of flavors it offered. Our cost (minus fractional things we had on hand) was $11.04, more than half of which was cheese. Given that we were able to get roughly 16 servings out of our pot, the cost per serving was about $0.63. First, I’d substitute ingredients all over the place. Use margarine instead of butter. Use skim milk instead of whole. Use low-fat cheese. Use turkey bacon. Use whole-grain pasta. Surprisingly, if you want to substitute for the chips, slice some kale and bake it – it tastes an awful lot like a potato chip. These things won’t drastically change the taste but will drastically reduce the fat content. Second, I’d halve the ingredients and serve it as a side dish. The whole dish would have served a small army, even as a main course. I wound up with an overflowing three quart baking dish – totally overkill for a family of four. Third, I wouldn’t sweat the cavatappi. Cavatappi can be hard to find and expensive when you find it. Just use whole wheat penne as your pasta, or even elbow macaroni. Fourth, I’d grate your own cheese. Turn on the water to boil the pasta first, then sit down to grate the cheese. It won’t add any time to the overall recipe, but it will save you some cash. If you want to get ready for it the night before, grate the cheese and cook the penne. The rest can be done pretty quickly. Bring a large pot of water with a pinch of salt in it to a boil and cook the pasta until it’s just slightly firm. Melt the butter in a large saucepan over medium heat. Add the flour and cook, stirring, for 1 minute. 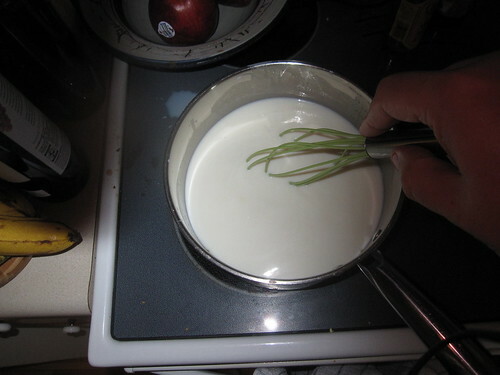 Whisk in the warmed milk and bring to a simmer, whisking constantly (the mixture will thicken as the heat increases). Stir the dry mustard, salt, black pepper, cayenne, nutmeg, hot sauce and Worcestershire sauce into the thickened milk. Stir in 1 1/2 cups of the cheddar and 3/4 cup Pecorino Romano, until the cheeses melt. 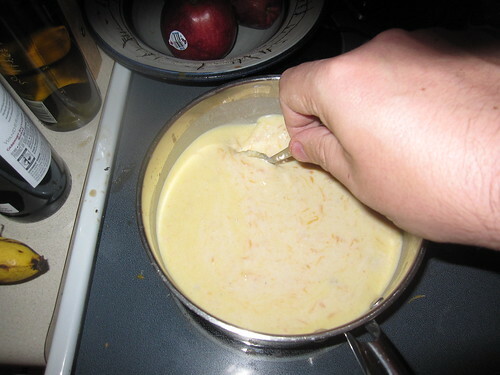 Add the cooked pasta to the cheese sauce, and toss to combine. 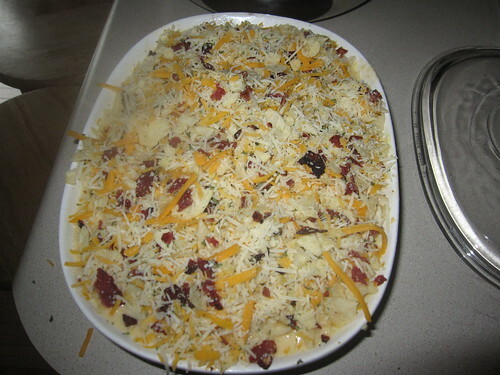 Pour the cheese-pasta mixture into the prepared casserole dish. Make the topping: In a medium bowl, combine the potato chips, cheddar, Pecorino Romano, crumbled bacon, and parsley. 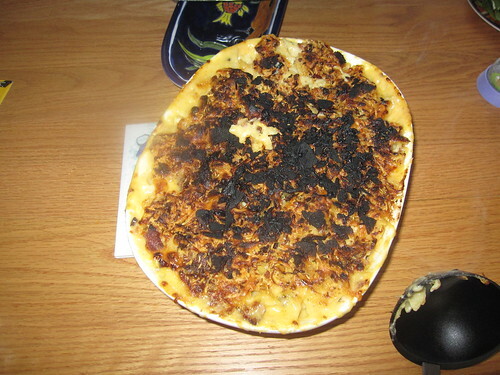 Sprinkle the crumb mixture on top of the macaroni and cheese, and bake for 35 minutes. For a crunchier topping, finish under the broiler for 2 minutes, until golden brown and crisp. Remove from the oven and cool for 5 minutes before serving.